What does Dallas' bike-share conundrum have to do with Captain Kirk's tribble trouble? EVERYTHING. The city is finally stepping in to take a more assertive role in the rental bike fray. Describing Dallas’ rental bike conundrum a day after City Manager T.C. Broadnax threw out an ultimatum to the bike-share companies in town, Mayor Mike Rawlings finally landed on the Star Trek analogy this city needs. The mayor still welcomes the dockless rental bike companies, praising them as a better alternative to the stationed bike-share systems found in Fort Worth and elsewhere. “We need to compliment the city that we were brilliant and didn’t spend millions of dollars for these stupid bike racks that Seattle and other cities are pulling out,” he says. Dallas has made progress on becoming more bike-friendly, adding trails and bike lanes, and generally becoming a nicer place to be outside of a car. That needs to continue, and bike-share companies can play a role in that, he says. However, Rawlings agrees partly with Katy Perry and others disturbed by the unregulated proliferation of the rental bikes, seen tangled and stacked and toppled in any number of awkward configurations, as documented by the Instagram account “Dallas Bike Mess.” There are too many bikes, a natural result of the free market arms race we’re seeing between LimeBike, Ofo, Spin, and the others. “If you can overwhelm a market, you can own it, and force the other bike companies out,” Rawlings says, summing up the business model that got us here. Letting the bike-share companies run rampant was, at least at first, part of the city’s plan. Let the market play out for six months, and then see what regulations may be necessary. “I think we got through about three or four months and realized we had some real issues,” and hundreds of complaints from residents, Rawlings says. There are going to be some new rules, starting with those outlined by Broadnax in his letter to the rental bike companies. For reference, here’s the relevant part of Broadnax’s letter. City Manager T.C. 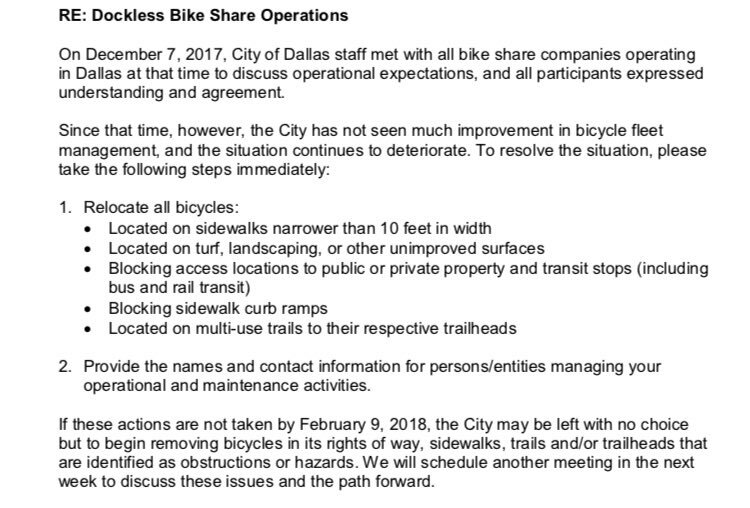 Broadnax’s letter to bike-share companies in Dallas. Rawlings’ appearance on The Ticket, billed as a “debate” by the Morning News, was a much more convivial affair. Bikes dominated his 10 or so minutes on the air, but we also got his thoughts on the possibility of Amazon relocating to Dallas—the city was just named one of Amazon’s 20 finalists in its search for a home for a new headquarters. The mayor gamely makes a comparison between Dallas and Amazon, two entities that have boomed in the last 15 years, big-upping Dallas as an “easy place to work” with a prime location for an international outfit like Amazon. Sure, but what are the odds Amazon actually comes to Dallas? “I don’t think anybody has a clue,” Rawlings says.